Swoon! 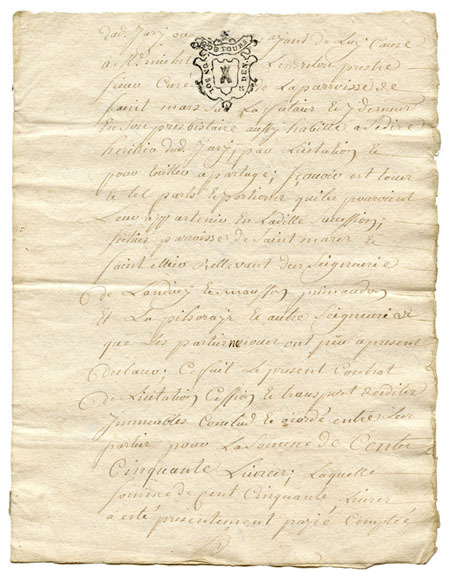 I’m so excited to share this amazing Antique French Letter with you guys today!! This gorgeous piece of Ephemera dates to Circa 1751!! Such an Old piece! I wish you could feel the paper on this one, it almost feels like fabric or maybe even suede, and it is super thick too! 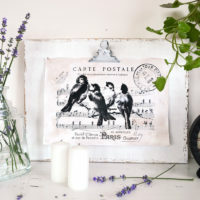 The handwriting on this is so beautiful and I adore the wonderful French Stamped thingy on the top.The writing is faded to perfection and the paper itself has some little imperfections and an age old patina that give it so much charm! I have no idea what it says, but I’m going to pretend it’s something lovely and romantic. Love that ruffled edge too. I’m always on the hunt for fabulous French paper pieces and Ephemera, so I was particularly pleased to come across this ancient beauty. I hope you like it too and I hope you can find a way to use it in your projects! Wouldn’t this make a gorgeous pillow? This would look fab transferred onto Linen, great for Flour Sack projects too! Of course you can use them for any of your DIY projects, like towels, signs, table runners and gorgeous on furniture pieces! I think you could even print this out and use it as wrapping paper for a small gift. The possibilities are endless so have fun with these! Distressed clipboard frame Project & Free Printable! Transfer Printable – Pretty Crown Free Butterflies Natural History Download – Beautiful! You are so welcome Jasmine!! I’m glad you like it! It looks amazing, Karen. Thanks for sharing it…..
Gorgeous, Karen! Thanks for sharing this. Aaah, so gorgeous. Thanks for sharing Karen! I love this thank you so much for sharing. The sales manager where I work is French, I will have ask her what it says! Thanks for sharing Karen. I have some old german post-cards which I’ll dig out and send you, for your followers. This is yummy! Thanks so much…and the reverse is brilliant…. 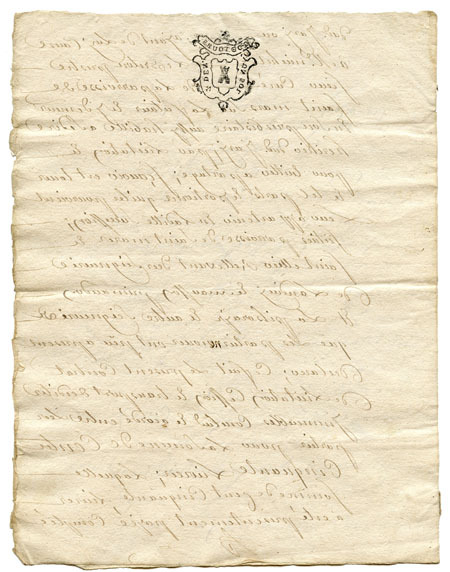 Is this letter on vellum? That would explain the thickness and the stiffness. 1751???????? That’s Amazing!!! THANKS for sharing! It’s beautiful! Does anyone speak French? It really doesn’t matter what it says, I want to use it on something. I am just a tad bit curious, only because it is so old and could give us a glimpse of life so long ago. I’m French but it’s a very old writing and I decipher only a few words. -date of this letter is XXVIII century later. There is no stamp and I read the name of the currency used on the blazon at the top. It is a currency that was used in the later 1750s. 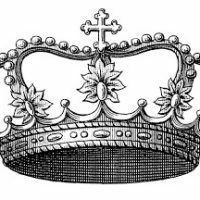 -it is the emblem of the city of Tours, 200km south of Paris. When the samples arrive I am going to share them on my blog. You always inspire with your ephemera. I LOVE this French Typography!!! So elegant. The texture must be wonderful to touch. Thank You so much for sharing. Gorgeous piece of ephemera. It’s hard to make out the writing, but it appears to be a receipt of some sort.